"The western side, from Luz-Saint-Sauveur, is 19 km long, climbing 1,404m at an average of 7.4 percent with a maximum of 10.2 near the summit." Thankfully, Tourmalet, the highest pass in the Pyrenees (at 2115m) was a morning climb. This had been billed as "the big one", mainly because it was, you know, the big one. I did my now usual trick of not pausing at the bottom to photograph the sign, giving me a handy head start. I got into my rhythm, set my mental power limit to 220 watts and started tapping away. From what I recall, the lower sections were through some little villages, all stone buildings and respite giving hairpins. At some point the trees disappeared to be replaced by Pyrenian pasture (I was going to say alpine, but we were clearly not in the Alps) which meant there was no relief from the sun. There was the odd ski station - a building, a car park - but very little else of interest. A 19km climb is an exercise in pacing. Some riders can judge their efforts by feel and experience. I use gadgets. Power-meter, heart rate monitor, mental-state-brainwave gauge. Plus looking at the numbers gives me something to do other than looking up, up, up at a road that seems to go up forever. 210w, 220w, 190w. Heart rate 145, not bad. That's tempo. Push it a bit more to 220w average and the HR is now 151. Hmm, OK, ease it back a bit. Gear down. Oh, lowest gear already. Um, pedal more slowly - cadence 58, 55, 57... Gradient for next km 7.6%. Then 9%. Then another 9%. I'm nearing the top now - well, 3km to go. I look up. I can see a building waaaaaay in the distance, far away and much higher than I am. Surely the pass doesn't go up there? 2km, 1km. Then there seem to be a couple of car-park ramps, 15-20%, 100m long. Right, final push. Top. Breathe. Our group King of the Mountains was already there. We recovered with Coke and Snickers, then I went souvenir shopping. 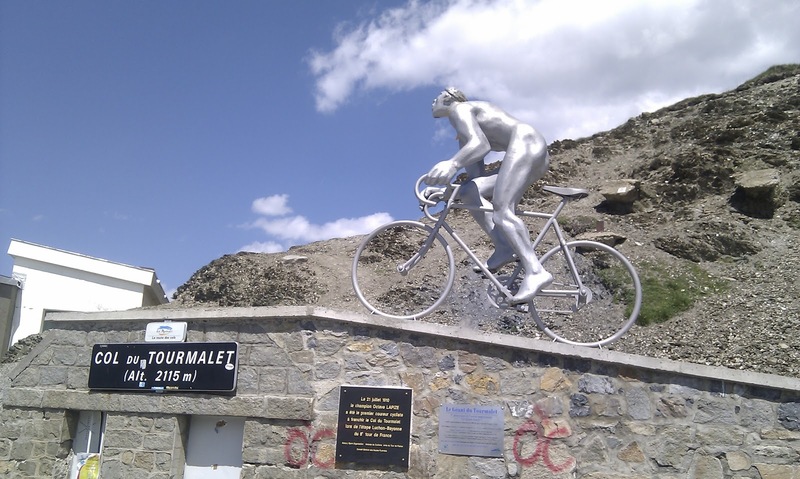 A cheap bike jersey for 60 Euros, Tourmalet branded. There were llamas at the top, skittering around and falling off things. I think they were real. We had lunch, we swooped down the descent, we started climbing again. 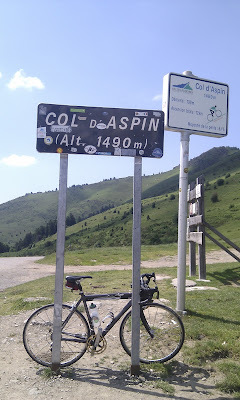 Col D'Aspin. Pretty, wooded, a bit like Wales. 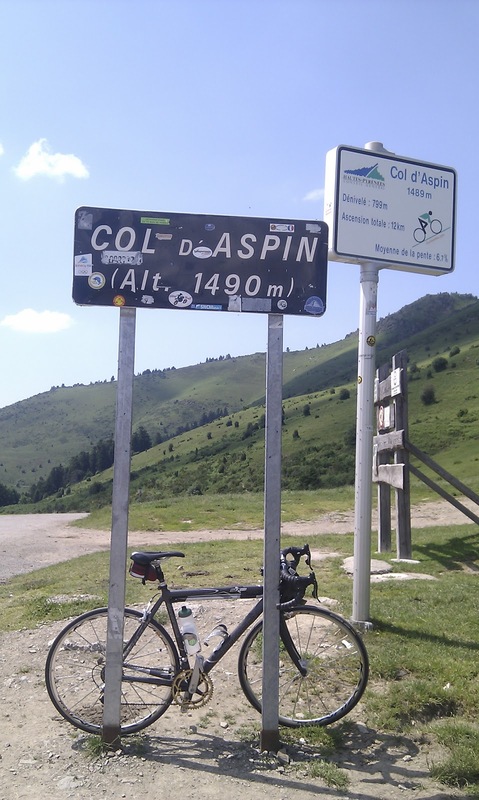 This climb was made harder by not having signs every kilometre - don't ask me why, it's not as if I'd been riding all my life with them. Then again, the biggest climb around Newbury is only 1.5km long, so there would only be one sign anyway. Then the descent. Slightly technical, lots of hairpins. Not the place where you want to have a front wheel puncture at 50kph. Guess what? Thankfully it was on a straight section so I eased to a stop, walked back up the road to a shady verge and had the flint removed, tube replaced and tyre back on before the support van arrived. I still got Dangerous Dave to pump it up though. Well, what else are guides for?